Vol.139 ジェロームに贈る ―『山葡萄』に寄せてー | （株）ラシーヌ RACINES CO,.LTD. We were glad to hear that Jerome’s new Cellar & House has completed at last. We, Yasuko and Masaaki, considered what would be appropriate as a gift for the new building and decided to judge after closely looking at the cellar/house. We were surprised to look at the whole building designed in modern sophisticated style and was planned to every detail as in Jerome’s way. Choice wood materials, conditions of light and wind were considered to the full, his sense and sensibility should be appreciated. Then, what becomes properly to this sophisticated space, a work of art? It became more difficult for us to find something special that should be fitted for here. Works of fine/folk art for the daily life, for example, designed or chosen by William Morris and Muneyoshi YANAGUI (often called Soetsu YANAGUI). A degree of perfection is indispensable element that we must look for. One year has passed since I started for the search and inquiring for a kind of art work and found two works of art at last. The first requirement for this special gift is compatibility to the theme of wine. In this case, wine has exquisite balance between Nature and Art fulfilling a kind of finesse. In other word, Sensitiveness and Science have to work together in the work of art like Champagne Prervost. Balance between Nature and Art is finely represented in a painted work entitled “YAMABUDOU”(Vitis coignetiae), a kind of wild grapes painted by Isson TANAKA. It could be appreciated as well made drawing by the hand of skilled master showing a feeling of autumnal season expressed rather in the way of understatement. The second candidate is a lithograph painted by Jean COCTEAUX that is entitled as La Poesie et Le Science. Like in Jerome’s Champagne, Poesie should go hand in hand with science. 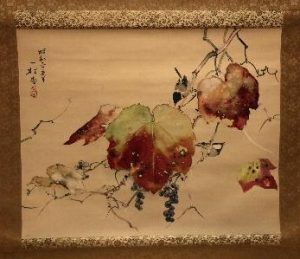 Both paintings from my small collection were once hung on the wall of our tasting room and the one with a image of wild grape was particularly well appreciated among art and wine lovers in our guests. This pushed me to decide for the gift. This is the reason how and why we chose a Japanese art of work for you. We sincerely hope both of you like it. Main Ingredients; malic acid, iron, calcium, polyphenol (contains 3～5 times more than average grapes) Characteristics; edible and is used for winemaking lately, and was awarded Silver Prize in international Wine Competition 1963 as “TOKATI AINU YAMABUDOU wine, made by late Dr. Sadao IWANO, ecologist. Biographical note; highly regarded as an infant genius at 5-6 years old. Called as “Japanese Paul Gauguin” because he did not belong to any painters‘ school as a proud lonely wolf, loved aloof life and lived in far South West Island “AMAMI OSHIMA” in his later years. Lately he is evaluated as one of the unknown great artists in postwar Japan.